How oceans and the atmosphere interact is an ongoing learning process, and that learning process is being enhanced at Texas A&M University with expertise provided by one of the world’s foremost authorities on the subject, British professor Peter Liss. Liss’s Texas A&M presence is made possible through a new initiative — the Texas A&M University Institute for Advanced Study — that brings nationally and internationally prominent scientists and scholars to the flagship university from three to twelve months during which they interact on a daily basis with the university’s permanent faculty in research and related endeavors and engage students at both the graduate and undergraduate levels. Liss, who is credited with important research on how the oceans and atmosphere interact, is affiliated with the Centre for Ocean and Atmospheric Studies at the University of East Anglia in England. He is a fellow of the U.K. Royal Society and recipient of numerous other prestigious awards and honors. During his current 12-month involvement at Texas A&M, Liss has already ­collaborated with faculty in the College of Geosciences and College of Science in preparation of several scientific papers for publication in scholarly journals and has several more in progress. That’s in addition to his ongoing interaction with numerous other faculty and students, along with periodic lectures open to the public. TIAS, the establishment of which was inspired by the Center for Advanced Studies at Princeton University, was made possible with special $5 million funding authorized by Texas A&M University System Chancellor John Sharp. Liss is one of six nationally and internationally acclaimed scientists and scholars inducted at Texas A&M in TIAS’ first class of TIAS Faculty Fellows in January, 2013. Liss is the only member of that first class to still be on campus as a TIAS Faculty Fellow at Texas A&M through the institute, though others have been here this year and one in the first class will be visiting multiple times over the next four years. Liss is not the last of the first class to be on campus, however, as one TIAS Faculty Fellow, Dr. Alan Needleman, has joined the permanent faculty of Texas A&M. Prof. John Junkins, founding director of TIAS, says Liss and his interaction with the university’s faculty and students represents the epitome of why the institute was created. “Great universities thrive on brilliant scholars,” Junkins explains. “We designed TIAS to attract the world’s top scholars across all disciplines to A&M to collaborate with our faculty and students, and Liss’s collaboration is a model for what we seek. Top scholars offer cutting-edge scholarship on the toughest and most important problems at the frontiers of their fields of study. In addition to seeking even better understanding of how the ocean and atmosphere interact, Liss and his colleagues are striving to attain a better grasp of the importance of that interaction. Life — all forms of life — is dependent on that interaction, Liss asserts. “The atmosphere is almost never still,” he notes. “When the wind blows — a gentle breeze or a howling hurricane — it moves material around, including solids such as dust (or larger) particles, liquids such as fresh or salt waters, or gases that make up the atmosphere itself. Perhaps the most important effect of this movement is the global water cycle, where water vapor is lost from the ocean through evaporation and re-deposited over the land as rain. “Without this cycle, multicellular life forms on land — including humans, would not exist,” Liss emphasizes, underscoring the significance of the atmospheric-ocean interaction. Both natural and man-made substances are transferred in both directions across the interface between the ocean and atmosphere, he notes, adding that these transfers are important for life in the oceans and affect atmospheric properties, including climate and air quality. Three aspects of ocean-atmosphere interactions have been selected for studies at Texas A&M because of their importance and generality: dust from land depositing on the oceans; the formation of particles in the marine atmosphere; and the uptake of carbon dioxide (CO2) by the oceans. “Dust particles from land are blown into the air, particularly from desert areas in China and Saharan Africa and are carried by winds around the globe,” Liss explains. “Saharan winds move dust westwards, while dust from the Gobi Desert in northern China moves east. Eventually a significant fraction is deposited on the oceans. The Sahara deposits dust on the North Atlantic Ocean, while the Gobi deposits dust particles on the east and south China Seas. Other desert and semi-desert areas supply dust to different parts of the global ocean. The amount of these deposits varies, depending largely on their proximity to source regions, he notes. The mineral grains that make up the dust are not particularly important to the oceans, but the amount of certain elements, such as the iron they contain, plays a significant role, Liss adds. Many of these elements are vital nutrients for the growth of microscopic plants (phytoplankton) in the sea. The Southern Oceans’ relatively small amounts of atmospheric input of iron may limit biological life. Several experiments in various parts of the ocean have shown that adding iron can increase phytoplankton production by a factor of four or five, although the effect is usually short-lived. This has led some to propose artificially fertilizing areas such as the Southern Oceans with iron as a purposeful way of getting the plankton to take up extra CO2, thereby removing it from the atmosphere. “Such proposals for geo-engineering the planet should be treated with great caution since unforeseen or underestimated secondary consequences might do more harm than good,” Liss warns. Much of the iron contained in the dust, however, is not in a form that can be assimilated by the phytoplankton. Iron and other metals contained in the dust can become available for assimilation through chemical reduction that renders them soluble. This can occur under the action of dissolved organic matter in seawater activated by light from the sun or by reaction with the atmospheric ozone. Such reactions are not well understood. 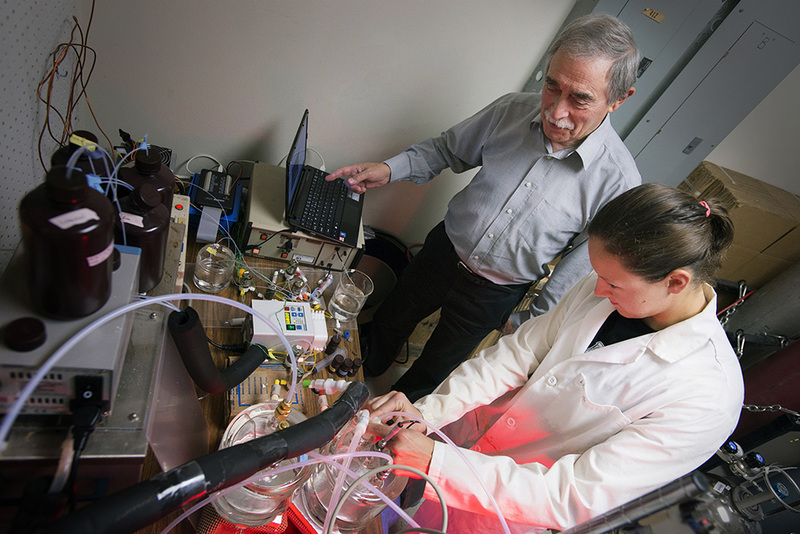 To address this problem, Alison Smyth, a master’s degree candidate at Texas A&M, is conducting laboratory experiments to try to establish the role of atmospheric ozone, after deposition to the ocean surface, in bringing about solubilisation of trace metals. Much of the dust blown from the land occurs as relatively large particles. Over the oceans, however, there are considerably greater numbers of fine particles. These can be formed from seawater, particularly under strong winds, or by condensation of gases emitted from surface seawater. Although the details of the reaction are not well understood, he says it is likely to involve organic molecules, sulfur dioxide, amines, iodine, and probably other substances, several of which are themselves formed from gases initially produced by phytoplankton in the surface oceans. The effects on the global climate of anthropogenic gases produced from burning fossil fuel and through industrial processes has been a much-discussed topic. Of these gases, which include refrigerants such as freons, Liss says the most significant is carbon dioxide. He says it is clear that in the warmer tropical parts of the oceans there is net emission of CO2, whereas in colder polar seas the reverse happens, with the difference providing the overall uptake. ”Given the substantial ability of the oceans to absorb CO2, it is vital to be able to predict whether this will change in the future, with clear implications for atmospheric levels of the gas and hence climate. In order to make such forecasts we need to understand the many processes involved so that they can be incorporated into predictive models. This all underscores how natural and man-made materials crossing from the oceans to the atmosphere and vice versa profoundly affect vital properties of both the oceans and the atmosphere, Liss emphasizes. They include the functioning of biological life in the oceans, the ability of the atmosphere to self-clean and eliminate pollutants harmful to humans, as well as the combined ocean/atmosphere system playing a major role in controlling the climate of the globe.